Arsenal signed the young talented winger in May 2004 for a 4ME fee. Soon he grew into one of the best players in the Arsenal squad as successor of Dutch legend Dennis Bergkamp. In July 2009 his contract was extended until 2013 and it looked that he continued his whole career at the Gunners. For seasons he was one of the best players and soon he was the appointed as captain of the team from French coach Arsene Wenger. However during the 2011-12 season, Arsenal directors wanted him to extend his in 2013 expiring contract. After long months of rumours, Van Persie stated that he was not going to extend his contract. Other clubs were attracted by his statement and were interested to sign the Dutch international. Mid August 2012, the news came that Manchester United signed the prolific forward and captain of Arsenal. 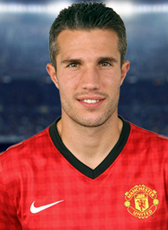 Van Persie signed a 4-year contract until June 2016 as Mancunian. With just a year left on his London contract, the club paid a huge transferfee around the 30 ME. One season before expiring his contract, Van Persie decided to leave to club who was then coached by Dutchman Louis van Gaal. He has less perspective to play for the club and was looking for new opportunities. He joined for a 5,5ME fee the Turkish giants Fenerbahce Istanbul. Van Persie has signed a 3-year contract. In January 2018 he returned home to join his former club Feyenoord on a 1,5 year contract. After weeks of rumours, he was finally released from his Turkish contract.